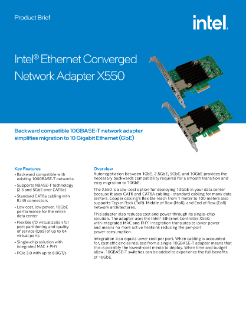 The Intel® Ethernet Converged Network Adapter X550 is the newest innovation in Intel’s leadership to drive 10 GbE into the broad server market. This adapter hosts Intel’s latest Ethernet silicon, the Intel® Ethernet Controller X550, a low cost single-chip 10GBASE-T solution for today’s server platforms. With 10GBASE-T, ...migration to 10 GbE is dramatically simplified with backward compatibility for your existing GbE network infrastructure. Install an X550 adapter into a server and the auto-negotiation between 1 GbE and 10 GbE provides the necessary backwards compatibility that most customers require for a smooth transition and easy migration to 10 GbE. When time and budget allows, 10GBASE-T switches can be added any time to experience the full benefits of 10 GbE. 10GBASE-T uses the copper twisted-pair cables that are very familiar to IT professionals today. It is all you know and love about 1000BASE-T. The knowledge, training, and investment in BASE-T are preserved. 10GBASE-T is the easiest and most versatile 10 GbE interface that can be deployed anywhere in your data center. Its flexible reach from 1 meter to 100 meters supports the latest network architectures including Top of Rack (ToR), Middle of Row (MoR), and End of Row (EoR).